Follow The Savior: 013. "I Am a Lover of the Cause of Christ"
013. "I Am a Lover of the Cause of Christ"
Briefly interrupting the tabernacle series to mark the 169th anniversary of the martyrdom of Joseph Smith and his brother Hyrum, both Prophets, Seers, and Relevators. The martrydom at Carthage Jail in Illinois took place at approximately 5pm. I know Joseph Smith was a true prophet of God because as I have studied and lived the words reveled to him, they have born good fruits in my life...fruits of faith, of knowledge, and of hope. They have helped me come closer to my Heavenly Father and His son Jesus Christ. 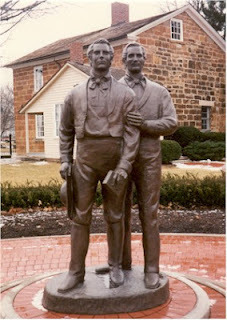 Without the works of Joseph Smith, including the Book of Mormon, the revelations in the Doctrine and Covenants, and the restored knowledge returned to us in the Pearl of Great Price and the Temple ordinances and endowment, we would have so little light and knowledge to guide us. I may not understand everything that he did or what happened in his life, but I look forward to the day when I can shake his hand, embrace him, and thank him for his faithfulness and sacrifice. He was a devoted servant of our Lord and a "lover of the cause of Christ".